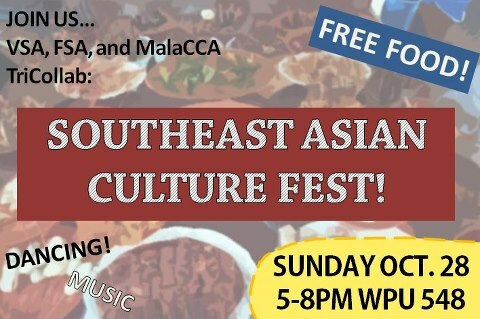 PennsylvAsia: Southeast Asian Culture Fest at Pitt, October 28. 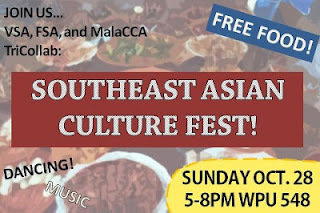 VSA (Vietnamese Students Association), FSA (Filipino Students Association), and MalaCCA (Malaysian Cultural Camaraderie) are “tri-collaborating” for our first ever (and hopefully annual) Southeast Asian Cultural Fest. Come and mingle with the e-boards and also sample some FREE cultural food, dances, and music. Your VSA, FSA and MalaCCA executive boards.